It’s the season for bright, fresh fruit in every color! There’s a full assortment of cherries, berries, apricots, mangos and more in your local grocery store’s produce department. Enjoy a piece of fruit on its own at any time of day or experiment by adding it to your favorite recipe for new flavors and textures. Mix fruit into oatmeal or cereal at breakfast, add it to your lunchtime salad or make a compote or salsa to complement meat or fish at dinner. And, of course, featuring fruit in your summer desserts will not only make them sweet and beautiful but also boost the nutrient content of your finishing touch! Here are our tips for adding fruit throughout the day. A well-rounded breakfast with fruit provides energy for the day and stifles less nutritious food cravings. Try roasting pears and filling them with ricotta cheese drizzled with maple syrup. Poach apricots in chamomile tea and add a little vanilla extract; serve over oatmeal, cottage cheese or yogurt. Fruit can be a wonderful and even surprising addition to savory dishes, too! Mash summer berries and add the mixture to a grilled cheese sandwich. Add berries, watermelon or stone fruits to a pasta salad or as an extra ingredient in your favorite gazpacho recipe. Have a smoothie for breakfast, lunch, or as a snack. 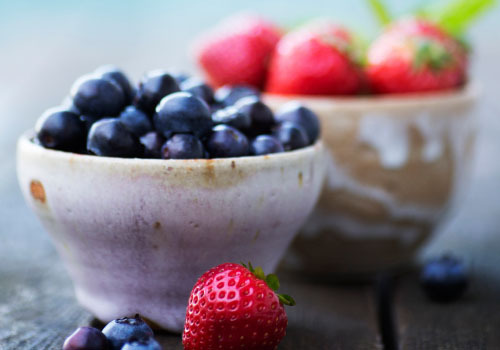 Blend your choice of yogurt, milk and juice with fresh or frozen fruit. For juice, select from nutrient-packed options, such as pomegranate, orange, grapefruit, apple, pineapple or cranberry. A mixed berry pavlova – a baked meringue topped with berry sauce – is certain to impress, and it’s not difficult to make. Or celebrate the season’s bounty by wrapping berries in rice paper wraps to create colorful fruit spring rolls.